What fun theme for a baby shower cake! 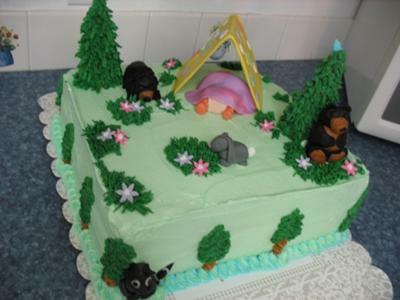 I love this camping cake sent in by our reader, Jen. The cute little baby camping in the woods is just precious. The woodland animals are great too! Thanks so much for sharing your cake with us Jen! I love it! This was the second of two baby shower cakes I made for my cousin. It was a 12" square white cake (I cheated and used a boxed mix) with homemade Bavarian Cream filling. I iced the cake with Buttercream (Wilton Class recipe). The cake is covered with mint colored buttercream. 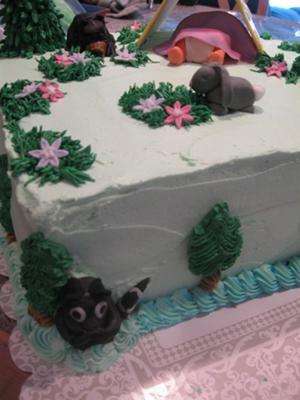 All the animals and baby were made with fondant. For the babies blanket I lightly marbled light blue and pink fondant. 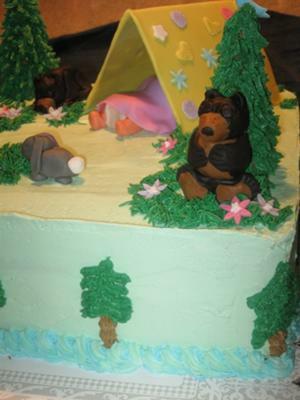 The tent is a piece of thin cardboard covered with fondant. I covered the cardboard lightly in buttercream and then covered in inside and out with pastel yellow fondant made with Wilton fondant and a small amount of lemon yellow Wilton coloring. The "patches" on the tent were cut free hand and with the Wilton small star cutter. The grass is buttercream colored with kelly green and the flowers are made of fondant with buttercream centers. I used the Wilton daisy fondant cutter in the smallest size to make the flowers. This is a really cute cake!